The Broad Creek watershed is comprised of about 75,000 acres in southwestern Sussex County. The 20-mile long creek rises east of Delmar and flows toward the northwest through through Trussum and Records Ponds to the Town of Laurel. The creek, which becomes tidal freshwater at this point, continues northwest to its confluence with the Nanticoke River southwest of Seaford. 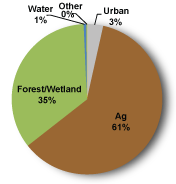 The major land use in the watershed is agriculture, although residential uses are important at Laurel. The Broad Creek Watershed has a high concentration of both poultry and swine operations. In addition, it has the greatest density of poultry per acre than any other watershed in the state as well as the largest area of cropland. It also is home to the Laurel Sewage Treatment Plant. The waters of the Broad Creek are designated as having Exceptional Recreational or Ecological Significance (ERES), and therefore, receive a higher level of protection. However, surface water quality data indicate stresses to the watershed, including high nutrient loads, high bacteria counts, and occasional low dissolved oxygen levels. According to the Total Maximum Daily Loads (TMDL) for the Broad Creek, nitrogen needs to be reduced by 30%, phosphorus needs to be reduced by 50%, and bacteria needs to be reduced by 3%. 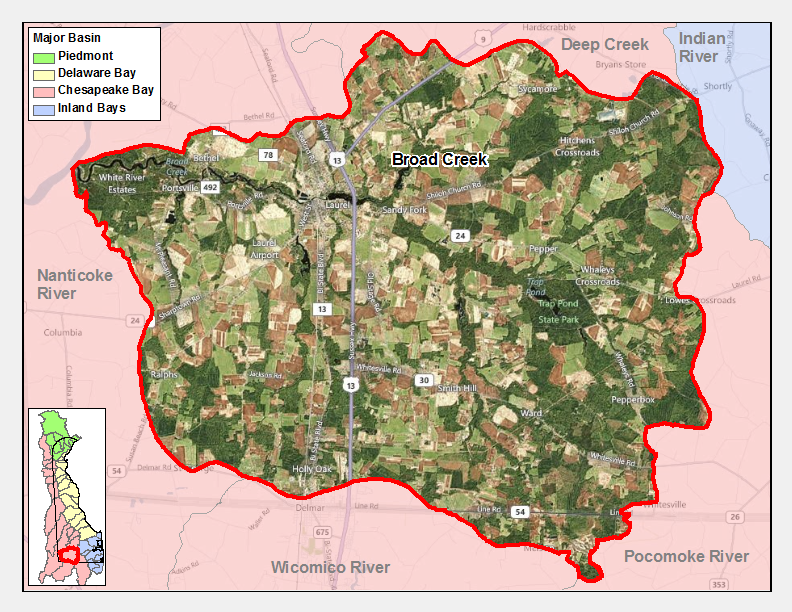 The Broad Creek Watershed has a total of seven sites listed in the Site Investigation and Restoration Section database. Five are state-fund lead (HSCA) sites, one is a Voluntary Cleanup Program (VCP) site and one is Brownfield program site. If you would like to view reports for any of the sites in the SIRS program please follow the link the DNREC Environmental Navigator to search by map for the Broad Creek Watershed. State-owned areas that provide access to water-based recreation include Horseys Pond, Records Pond, and Raccoon Pond.